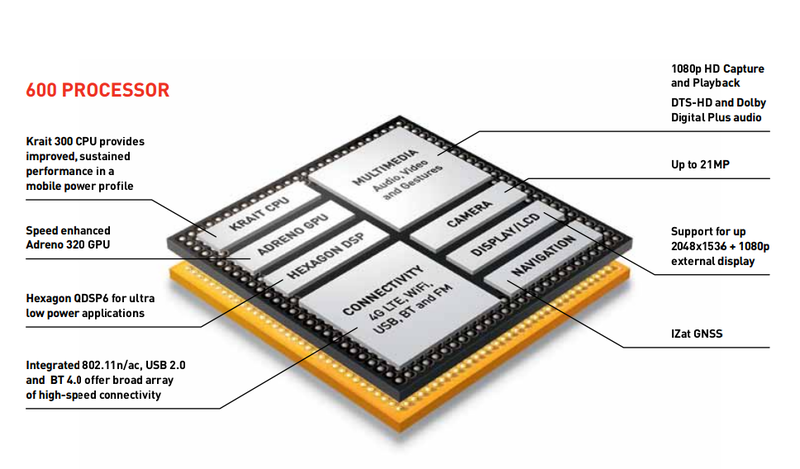 The Qualcomm Snapdragon 600 APQ8064T is a high-end SoC for mostly Android based smartphones and tablets that was announced at the beginning of 2013. The chip includes four ARMv7 compatible Krait-300 cores that offer a slightly improved architecture compared to the Krait cores in the S4 processors (according to Anandtech). However, the performance of Cortex-A15 cores should not be reached, but the power consumption should be better. The integrated "enhanced" Adreno 320 graphics card offers higher clock rates compared to the one found in the Snapdragon S4 SoCs.